Omega CentauriThe grand-daddy of them all. 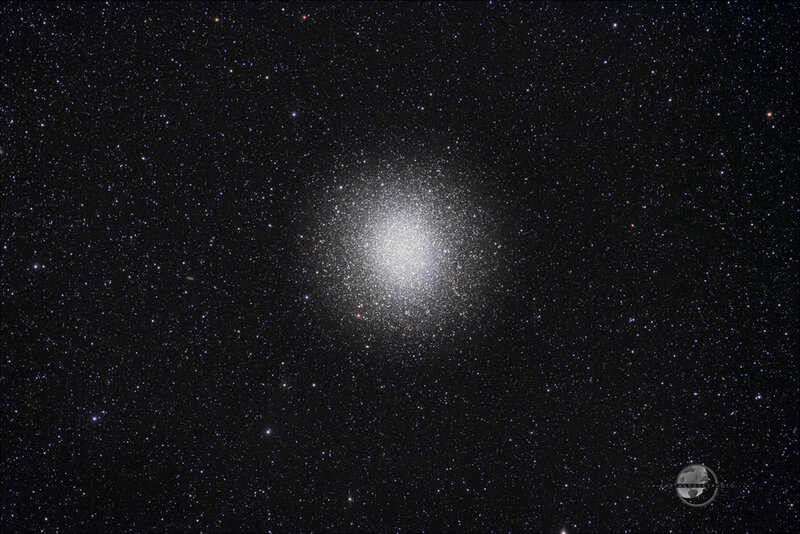 The globular cluster in Centaurus is the biggest and brightest in the Milky Way Galaxy. It is estimated that over 10 million stars are rotating around the cluster's core. The cluster is designated as NGC 5139 on star charts and lies over 18 thousand light years away. The cluster is 150 light years across and is estimated to be over 12 billion years old! It is a glorious sight in a telescope and is best viewed from southern latitudes. This image was taken during the 2010 Winter Star Party in the Florida Keys. Technical details: Images were acquired with a modified Canon T1i on a Takahashi 85 FSQ with focal reducer. The tracking mount used was an Astro-Physics Mach1 GTO. Images were converted in Adobe Light Room 3.0, combined with DeepSky Stacker, and enhanced in Adobe Photoshop CS5. There are approximately 60 images combined with varying ISOs to obtain the final image. The image may be seen in larger portfolio presentation in the Color Astrophotography Gallery. Horsehead Nebula, copyright 2010 Jeff BallI love revisiting old friends with new gear and that is exactly what this image represents. The new gear was the Takahashi FSQ 85 and the Canon T1i camera modified by Brent Maynard. It also represents many new enhancement techniques that I have learned over the past few months. That is why we often revisit familiar friends, to bring new interpretation to the image through either refined artistic vision, new gear, new techniques, or all of the above. Unfortunately, all of the new techniques require a great deal of time and result in a rather lengthy image optimization process. I hope to be more efficient with time, but I do like to let the image "stew" for a while before it is "served." 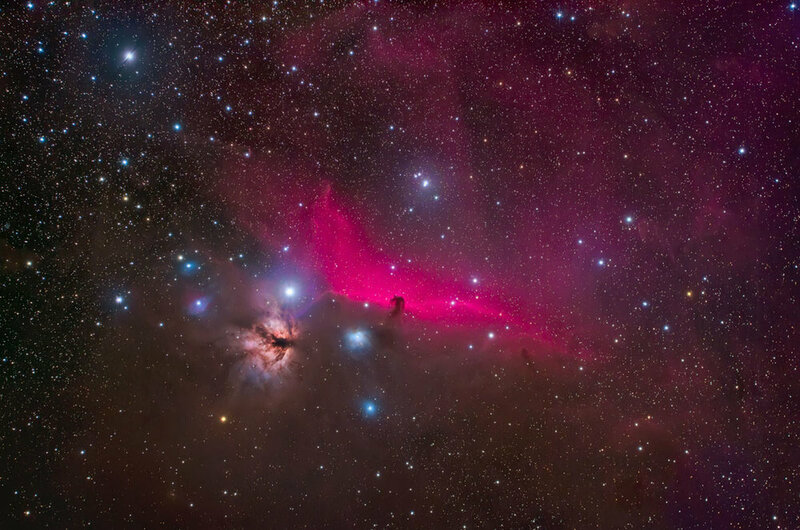 The image may be seen at this link "Horsehead Nebula." Please don't forget to click on the image for optimum presentation in a portfolio window. I hope you enjoy the image of one of the great areas of our Milky Way galaxy. The area is around the star Alnitak in the constellation Orion and is approximately 1600 light years away. For scientific information on the area please see this link. 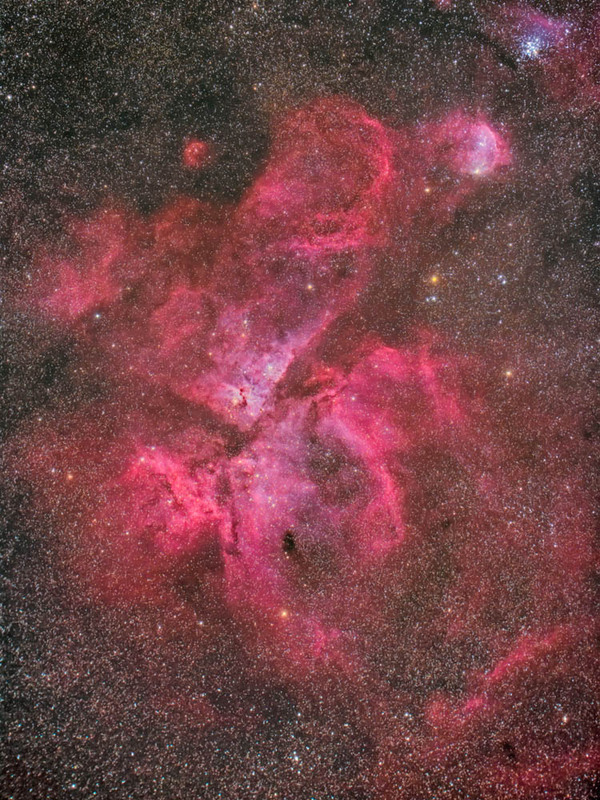 The Eta Carinae NebulaA rare opportunity...to image Eta Carina from the northern hemisphere. I have been to WSP on three occasions and finally had a night for the ages. The transparency on the night of February 11 was incredible. I typically don't hold out much hope for transparent skies down to the horizon where most of the time ocean haze and persistent low clouds tend to hang out. On this night after gathering some very good data on the Witch Head Nebula, we started to get excited about the possibilities of imaging Eta. Our group of imagers began monitoring the sky quality on the ocean horizon early in the evening and we were seeing stars lower and lower as time passed. Eta climbs only a meager 8 degrees or so above the ocean from 24 degrees north latitude on Big Pine Key. We were easily seeing stars at this elevation and even lower, nearly all the way to the ocean horizon. After completing the data acquisition on the Witch Head nebula, I began to prep for imaging Eta. Just to give you and idea about how low this object is, most of the time our telescopes are pointing nearly straight up into the darkness, but on this night they were pointed nearly horizontal toward one of the largest nebula in the Milky Way Galaxy. My first glimpse of the camera LCD screen showed the incredible nebulosity complex and I began to get very excited about the opportunity this night was giving to us. A total of 100 minutes of usable data was acquired and here is the final presentation. I will have a future blog on the details around the acquisition of the image. I hope you enjoy the image and that you get a chance to take in the Eta Carinae nebula for yourself through a large telescope at some point in your life. Please visit the Color Astronomical Gallery and click on the image for a larger presentation. You may also purchase a fine art print of Eta Carinae by either emailing me, phoning, or simply using the online purchase option.